The Land of the Maple Leaf invites you to join us in a fantastic week of fishing, sightseeing, or hunting on the Picturesque Lady Evelyn Lake. Your heart will be captured instantly by the Beauty and Peacefulness of the unspoiled waters of Northern Ontario. Lady Evelyn Lake is a man made body of water which originally started off as only a river, in 1925 a Hydro control dam was built. There has never been road access to the Lake, it can only be accessed by water or air, which has fortunately protected our waters from being overpopulated & spoiled. No matter where you choose to drop anchor, you'll find great species of fish. Walleye (Pickerel), Pike & Bass are waiting to bite your line whether you Troll, Drift, Still Fish or Cast. 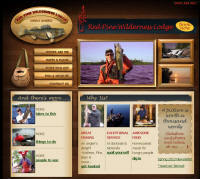 Maybe you would rather take a day trip into one of our remote lakes and try your hand at some Trout. Maple Mountain is the second highest peak in Ontario and is only 18 miles from Camp. Take a trip and experience the thrill of climbing this peak. There is a well marked trail, you'll find the scenery breathtaking. Located on a 13 acre island at the western end of Lady Evelyn Lake. 9 private cabins sleeping between 2 and 6 people. The sauna is centrally located next to the lodge. The cabins are 75 to 100 feet apart to give privacy to each party, yet each cabin has over looks the lake. Our private dining room is contained in the air conditioned main Lodge building and is open only to our guests. We now have a Chef on staff. Our breakfast menu includes among other things, eggs benedict, pancakes and sausages, scrambled eggs and ham, bacon and eggs, toast and jam, omelet's made to order, etc. while our dinners include meals like BBQ'd cedar planked salmon, buttermilk chicken, bbq chicken & smoked ribs, scallop salad with a warm basil and tomato dressing and all sorts of quality favorites. We pack a shore lunch for you take out on the lake daily. We have 24 hour hydro with wifi. Each cabin is equipped with propane furnaces and has indoor plumbing with showers. The boats and motors provided at Garden Island Lodge are some of the finest offered anywhere. Our 30 horse power electric start motors are all Mercury models. The Lund 16.5 foot deep 'V' boats are exceedingly comfortable with high backed swivel pedestal seats (with lumbar support), raised flat floor, casting deck, and more! Located on a 7½ acre island on Lady Evelyn Lake, Red Pine offers 7 fully-equipped cottages, a main dining room, and Finnish sauna set amidst towering red pines. Private docks for each cottage. Choice of American plan or housekeeping packages with 16' boats and 15 hp motors, gas, and bait. Three piece bathrooms and a central shower house. Lady Evelyn Lake provides anglers with the opportunity to fish for walleye, northern pike, smallmouth bass, and there are trout lakes nearby. Excellent service and a family atmosphere. Come and share our piece of Northern Ontario.